Looking over my front wings, I notice some interesting things. These wings are 10 feet long. They are made of four main formed or shaped pieces welded together with really beautiful welds, so good you can’t see them on the outside with all the paint off, really nice workmanship. Then there are the 2 pods held in position by 2 screws each and then spot welded all around, and six more small pieces welded on. 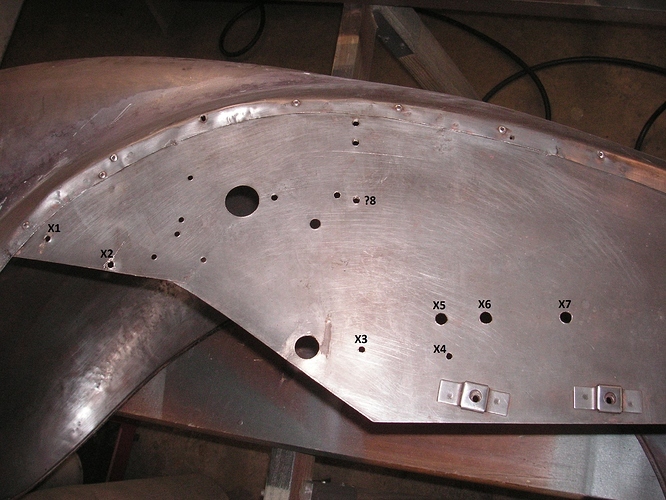 The upper valence panels were pop riveted on with 3 pop rivets before they came back with spot welding. The trim beading was pop riveted on. There are 3 clip brackets for the bonnet side panel on the left side but only 2 on the right. I don’t understand that, but the parts catalogue lists only 5. The left and right upper valence panels are actually the same panel; all the punched holes are exactly the same, and the punching draws are in the same direction. Someone drilled some extraneous holes in the right valence so I am filling them with plug welds. Here I have labeled with an X the 7 holes I believe to be wrong, since they are not found on the left side and my disassembly notes say they were not being used. what about the hole number 8? My horn relay was there. It doesn’t fit anywhere else. The screw hole spacing is 2-5/8". It is a Lucas SB40 dated 2-50 so I believe it to be original. where do you guys have your horn relay? my car is LHD, so shouldn’t the horn relay be on the left side near my steering column? 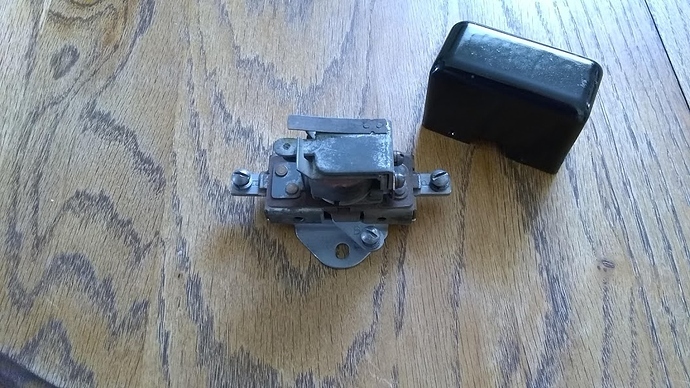 was there an earlier Lucas relay with screw spacing of 2"? Thanks for any guidance or other thoughts. I no longer have this car so can only offer photos taken back when I had it and it was right hand drive. Your horn relay is different from mine. You have a mounting bar on the cover. It looks like the cover might be smaller than mine, which would mean the screw spacing might be 2". 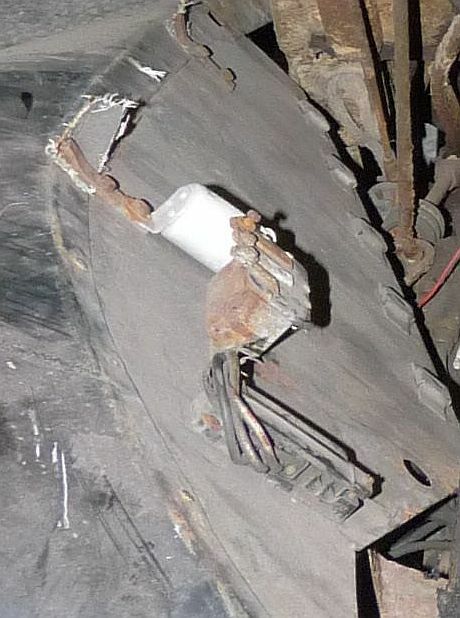 Mine has the screw holes on the coil chassis base. I also have that 8 way bullet connector block, but on the left side. I have a 5 way bullet connector block on the right side. Interesting that yours had a flasher being RHD and presumably trafficators. I have that same flasher on the left side. I think the flasher was just a non-standard late addition. Yes, I see a PO of yours had added turn signals lower down as many of them in the UK and Australia did. That RetroClassic relay is seen on most 120s and is C.4532 or Lucas 33135/B, similar mounting plate idea but it has 4 terminals. It was also on the latest Mark V DHCs. Mine is C.2782 or Lucas 33116/A Type SB.40 L.2 with 3 terminals. Your Mark V may have an earlier version than mine. I looked in the regular Mark IV books and did not see any horn relay listed. All I could find was C.2554 or Lucas 33110/A SB.40 Type L is in the Mark IV LHD book page 79. Did most Mark IVs not have a horn relay? I think all the 6 cylinder MkIVs had the relay. There were changes in the horn type but no indication of change to the relay. I can remember seeing one on a Dec. 1947 car and also on a May 1948 car. Both were of the type in your photo Rob.The MkV in my photos was Nov. 1950. Yes, that’s the same page I found in the LHD book J.6 dated Nov '48. 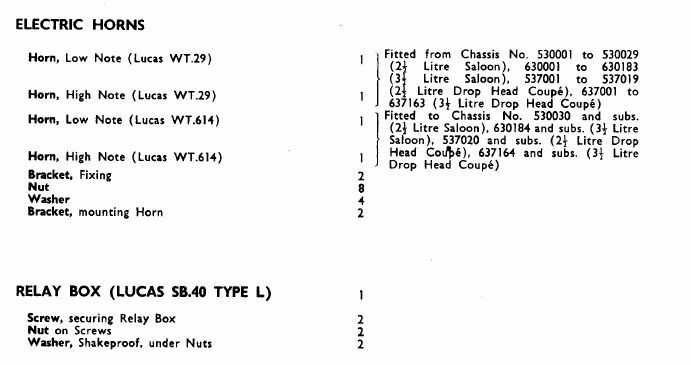 I also found the horn relay in the 1.5 Litre LHD parts book J.5 on page 81 where it says 33110/A was used on chassis 430233 and subs. This book is dated Oct '48. I find no relay at all in the pre-war parts books, nor in the early post-war books J.1 through J.3 dated Nov '46, Aug '47 and Dec '47. I don’t have anything called J.4. So without much solid evidence, I am inclined to offer this guess as to what happened. The horn relay 33110/A was added to all cars some time in '47 and failed to get into the parts books, but it did get into the LHD Mark IV books published in '48. Mark Vs also initially got the 33110/A and the upper valence panels were punched for it. At some point Lucas began supplying them with 33116/A and my valence panel received an extra hand drilled hole to fit it. But the driller didn’t know whether my wing was to go on a LHD or RHD car, so he drilled the right side wing, as most of them were RHDs. The earlier relay 33110 didn’t get into the Mark V book because by the time it was written they were only supplying 33116 for replacements. That’s my working theory at any rate. Hi Rob, here are photos of left hand and right hand valences on my Mark V. Holes X1-X7 do not exist on my car. Hole X8 is used (and the hole just to the left of X8 on your “X”-marked photo exists but is unused). This car was built 26 June 1950 and dispatched for Los Angeles delivery. That should be “?8” not “X8” in my reply. Also, my car has 3 clip brackets on the left side and 2 on the right. If you want better photos or description of any of the parts, just say where to focus. Thanks for confirming about the holes and bonnet clips, Roger. Do I see a relay on each side? Which is for the horn? What is the purpose of the other one? 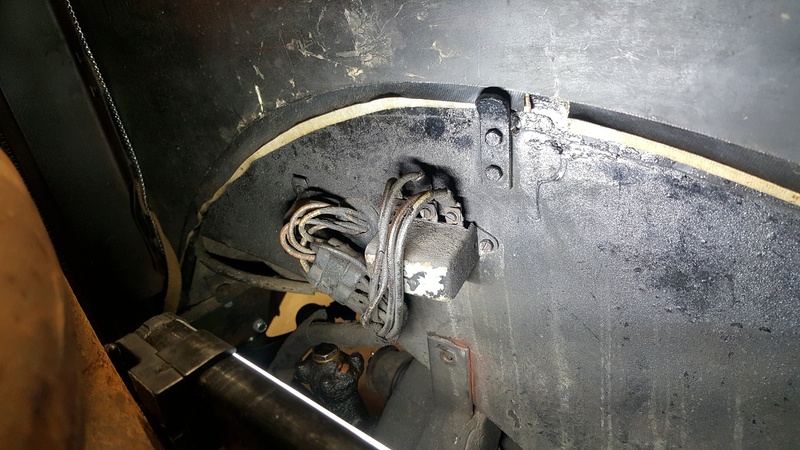 Relay on left side valence is Lucas DB10 relay for turn signal and rear light coordination. Horn relay is on right side valence. Ok now I recognize the DB10; I am familiar with it on my XK120, but was not expecting to see one on a Mark V, especially a US delivered car. Mine does not have it because I have these taillights with separate turn signal bulbs. I dug out my original wiring harness and compared it to wiring diagram W76522, and I can see how the horn wiring was done for my LHD. 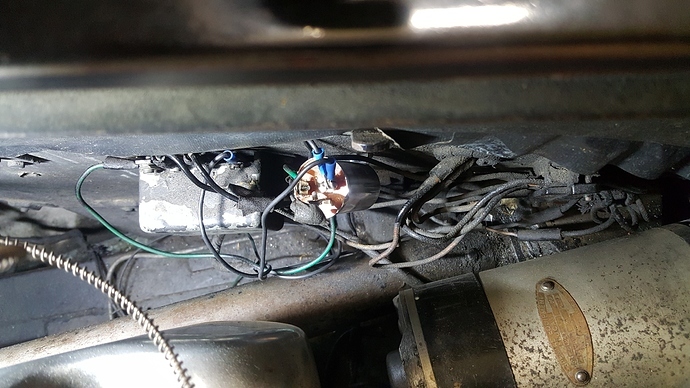 The #35 wire from the relay on the right side runs across the front and plugs into the wire from the steering column on the left with a single bullet connector. Contrary to the Service Manual which on page P16 says the LHD has the horn relay on the left. Why should I be surprised? I’ll have to think about this some more, but it looks like I’ll have to get my new wiring harness in hand and see where the horn wires are, before I can decide whether to put the horn relay on the left or right, whether or not to fill the #8 hole on the right before I paint the fender. On mine (LHD DHC) it sits just like in your photo, and unlike in Roger’s photo, on mine the contacts are facing down (yes, very inconvenient to work on) on mine all wiring has been replaced, so not original, but I could swear the screws had never been opende after the car was finished on Holbrook Lane on July 14th 1950! My car had not had any horns for decades, but the relay was still there. I have some new information to add to this topic. 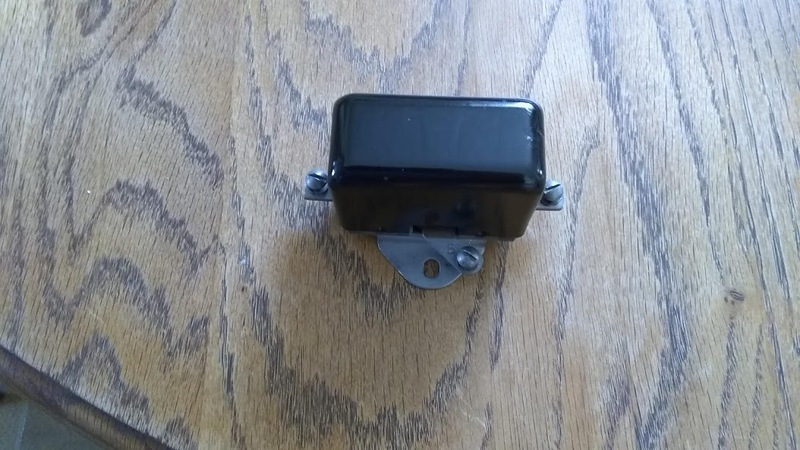 Going through a box of Mark V parts that came to me last autumn, I found a relay, black cover, looks like a Lucas product. On the bottom is stamped 12V 33105B 10 49, but with no Lucas nor their logo. 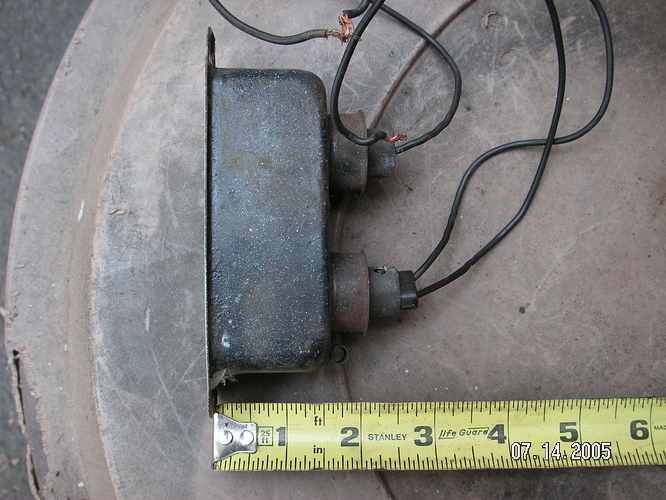 The terminals are stamped H, B and P.
H (left) is a contact, B (side) is both a contact and one side of the coil, and P (right) is the other side of the coil. Mounting hole spacing is 2 inches, which would fit on my Mark V front wing valences, either side. Urs Schmid shows this one in his XK120 book, Vol 1 pg 170. 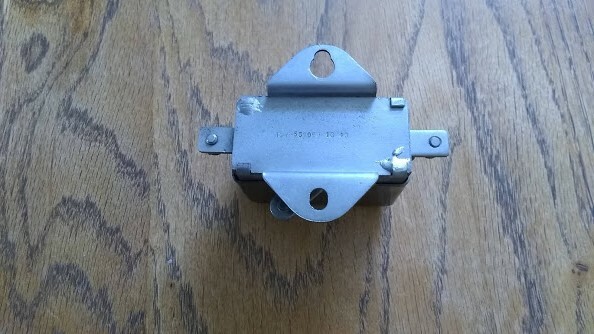 So I am inclined to believe that this was the original horn relay used on early Mark Vs, and some time between 10-49 and 2-50 Lucas brought out an improved version 33116A with hole spacing 2-5/8", which was installed on my car in 4-50.